MCC Haiti logistics manager Herve Alcinna manages a relief distribution in the community of Bingo, in Haiti’s Northwest Department, in October 2018. 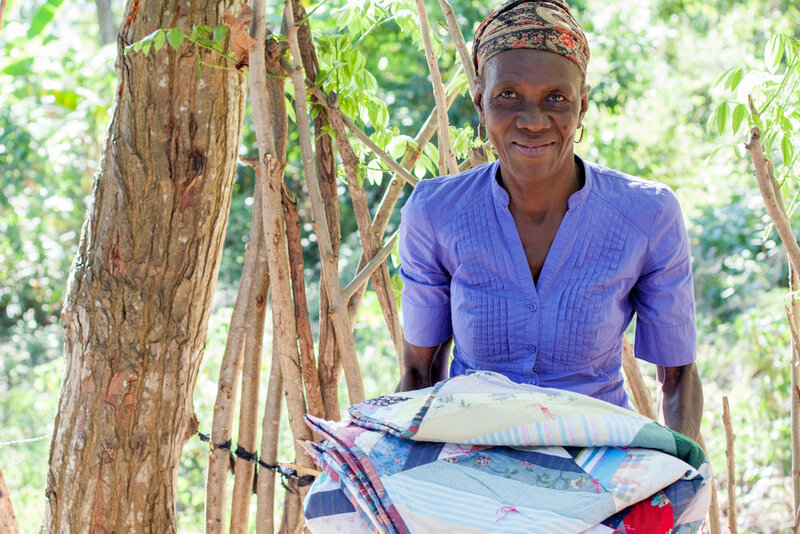 Maria Vinceus was in her house with her daughter and granddaughter in the small community of Bingo, in Haiti’s Northwest department (province), when the house started to shake. Vinceus’s daughter and granddaughter, asleep in bed, woke up and immediately knew something was wrong. They jumped up from the bed and fled the house, managing to escape before they were hurt. Haiti is no stranger to earthquakes. On January 12th, 2010, a huge earthquake shattered the nation’s densely crowded capital, Port-au-Prince, killing hundreds of thousands of people and leaving nearly a million homeless. The earthquake Vinceus experienced, on October 6th, 2018, struck near the northern city of Port-de-Paix, about 50 km from Bingo. At 5.9 on the Richter scale, it was the largest earthquake since 2010. In Haiti, there are several possible ways MCC might respond when disasters occur. Immediate distribution of material resources shortly after a disaster can help meet the basic needs of those who have lost homes or belongings, while long-term mental health projects help address the ongoing psychological aftereffects of disasters. Maria Vinceus receives an MCC relief bucket and comforter at the relief distribution in her community of Bingo. Thankfully, Maria Vinceus and her family were unhurt after the October 6th earthquake, but their house was badly damaged. The Northwest is one of the poorest areas in Haiti. This chronic poverty, worsened by long-lasting damaged caused by 2016’s Hurricane Matthew, meant that many buildings in the area were unable to withstand even a moderate earthquake like the one that shook the area on October 6th. In partnership with Church World Service and the Association of Evangelical Groups of Haiti for Preaching and the Development of a New Generation (AGEHPMDNG by its initials in French), MCC provided relief buckets, water treatment tablets and comforters for distribution to primarily female-headed households damaged by the earthquake in Bingo and the surrounding communities. Not only the contents of the relief bucket, but the buckets themselves find a use in households in need. On the same day the earthquake struck near Bingo on October 6th, Joseph Saingelus felt the tremors at his home in Port-au-Prince, 124 miles away from its epicenter. “I was very anxious, I ran outside right away,” says Saingelus, After that earthquake, like many other survivors who were too afraid to go back into their houses as aftershocks rocked the devastated city, he slept outside with his family. Eight years later, as Vinceus and Premilus’s families were sleeping outside after the earthquake near Bingo, Saingelus’s memories of the 2010 earthquake in Port-au-Prince came rushing back. The earthquake that struck Port-au-Prince in 2010 has had significant long-terms effects on Haitian society and individuals. While Saingelus’s anxiety has diminished over time, this is not the case for everyone. Natural disasters are among the potential causes of Post-Traumatic Stress Disorder, a mental health condition in which the experience or witnessing of a traumatic event can cause flashbacks, nightmares, and uncontrollable upsetting memories, among other symptoms. Rates of PTSD in Port-au-Prince are high—between 25 and 37 percent, similar to the rate found in combat veterans. But in a medical system that struggles to meet even the most basic needs of the Haitian population, mental health care is not seen as a priority. Damage to the interior wall of the primary school in Bingo caused by the October 6th 2018 earthquake. Many parents report that, after the earthquake, their children are afraid to enter buildings like homes or schools. Rebecca Shetler Fast is a licensed clinical social worker with a specialty in trauma who now lives and works in Port-au-Prince as MCC’s representative for Haiti. MCC works with Zanmi Lasante, Partners in Health’s sister organization in Haiti, supporting a team of 14 psychologists and 31 community health workers who provide mental health care to people who would not otherwise have access or resources to access mental health treatment. In addition to supporting existing mental health interventions, MCC is also supporting Zanmi Lasante as they develop the first evidence-based clinical PTSD intervention in Haiti. This treatment is an adapted form of cognitive processing therapy (CPT), a mental health treatment modality that addresses the underlying causes of PTSD by helping patients shift their beliefs about the cause of the trauma from damaging self-blame to more constructive, nuanced perspectives. A member of AGEHPMDNG prepares for a relief distribution in the commune of Jean Rabel, in Haiti’s Northwest department, October 2018. A relief bucket is a small thing, a way of restoring a little bit of normalcy to a life suddenly upended by disaster. Staff of CWS and AGEHPMDNG described the buckets as a “gesture of solidarity,” a much-appreciated indication that residents of poor, remote communities like Bingo haven’t been forgotten by the outside world. For residents of Bingo and the surrounding communities, these relief buckets, comforters and water treatment tabs are the beginning of a long process of recovery. For some, the most difficult part will be finding the resources to repair a roof or pay for a new door. For others, it may be recovering from traumatic memories of the earthquake. Throughout the world, MCC responds to disasters from its emergency relief fund. 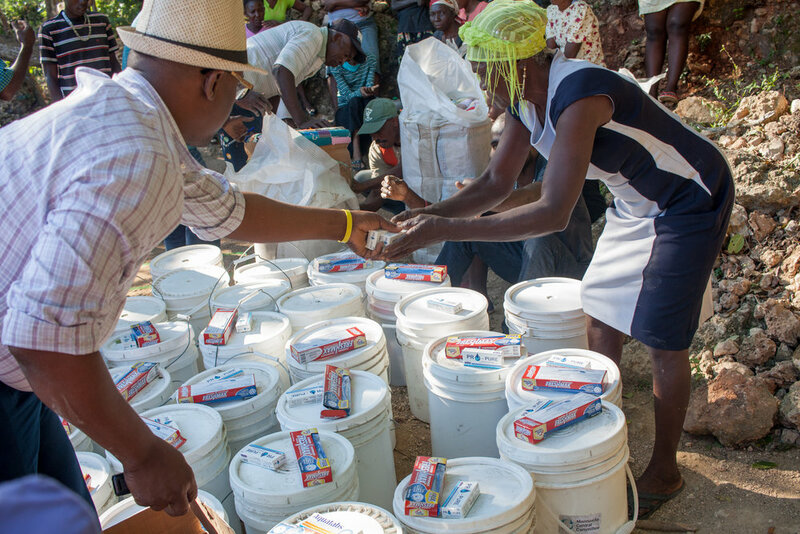 In Haiti, this support enabled MCC in Haiti to respond to the October 6th 2018 earthquake with relief buckets and comforters, to Hurricane Matthew with cholera prevention projects and psychosocial support for women and girls, and to the 2010 earthquake with housing, trauma support and support for livelihoods. By donating to this fund, you enable MCC to stand in solidarity with those in crisis in Haiti and around the world, whether in large ways or small.